Tuesday started off as a pretty normal day. I knew snow was in the forecast, and was pretty excited about it for the boys. I went to work and was told our office would close early and folks could take off when needed to be able to get home safely. I got a lot of work done in the morning and decided I’d stick around to eat lunch, and then hit the road. No rush. The snow had just started at my work when I set off for home. 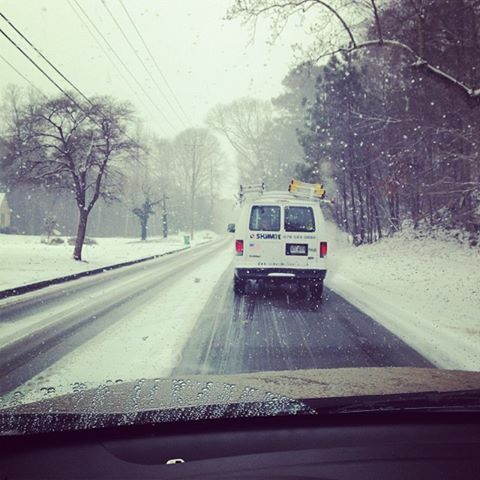 The first couple of miles were pretty easy… the roads were definitely getting snowy, but all the traffic was moving. A couple miles down the interstate… a couple miles down my first surface street… and then I stopped. I could see cars up ahead going really slow over a bridge that was iced over. I thought, okay, once we get over this bridge, it should be smooth sailing. After all, it was only about 1pm at this point… way too early for traffic to be bad. I creeped along, finally passing the bridge, and then traveled about a mile over the next 30 minutes. And then I really stopped. Like, my car didn’t move for about an hour. I kept checking my traffic apps, trying to get some info on what in the world was making us stop. My Waze app, confused about whether I was heading east or west (because I was still) kept re-routing me to a route that offered a 2 hour and 15 minute commute. What?? No way was I going to be in the car that long! As I’m waiting, I realize my phone isn’t working properly – I can only connect one out of every 20 calls I try to make. Then I see a man coming the other direction with his windows down. He tells us that the we won’t be going anywhere because there are cars up ahead who can’t get up a hill and they have slid back and are blocking traffic. Great. I start playing out the options in my mind. The road I was on was divided with two lanes on each side. I came to the conclusion that I’d likely be sitting here a while anyways, so I might as well cross the medium, head in the other direction, and try out my alternate Waze route. Ok, so something you should know about me, I’m not a real risk taker when it comes to these sorts of things. I start getting real anxious when I have to do something against the grain. It stresses me out. But it still seemed like my best bet, so I took my Saturn VUE (with new tires, thank God), and went over that median. I got up it just fine, but got snagged by the underbelly of my car. I hit the gas, made it all the way over and tried to regain control of my ride when all four wheels hit the ice on the other side. But I did. Mission successful… so far. I continued onto my new route as conditions worsened. I was riding along a residential road with a couple other cars and was actually making progress… until we stopped again. This time I was stopped for about another hour. Come to find out a car up ahead had run out of gas. A good samaritan stopped to top her off and I was on the road again. At this point, I knew where I was, but had never traveled this road before. I became acutely aware that the decisions I was making to turn right, turn left or go straight were really important because any road that had a hill was virtually impassible. I made a series of turns that landed me on my first bad decision. There I was stopped again with dozens and dozens of other cars, all halted because cars ahead couldn’t make it up a hill. And by this I mean they’d try to go up and slide back down and wind up stuck on the ice. This resulted in four or five cars completely blocking the road. I made the call to turn around again, however this move got me stuck on the ice. I tried alternating between drive and reverse to gain some traction, but it was unsuccessful; panic started to set in. And then two ladies hopped out of their SUV and got the attention of some people walking (two women and a man), and they pushed my car to get me free. Such awesome people! At this point I began to enter freak-out mode. I started wondering if I’d ever make it home since each way I turned I was met with another impassible road. I had to pee. I decided that even though the main road I was originally on was gridlocked, I’d try to make it back there, with the thinking that if local authorities were going to clear a road, it would be that one first. Fast forward another hour, and I was back on the main road. Fast forward another hour and I made it to a QT. I used the facilities, got some snacks and regained my composure. At this point I realized that I may be in the car all night, but that I’d be okay. I had a full tank of gas, a phone charger, plenty of water and food. I realized that I was much more fortunate than many others out there. I was humbled as I saw a school bus full of kids (probably middle school or high school) in traffic right next to me. And I thought of the bus driver… what an enormous amount of responsibility and stress she must be feeling – what does she do with kids who have to go to the bathroom? Kids who are hungry? Who are cold? Mind you, at this time the temperature was 25 degrees. My heart just sank for that driver and all the other ones who I’d seen out on the road. In the span of about two hours, I made it about a quarter of a mile and was at an intersection. Although I had established a strategy to stay on this road, I kept questioning whether it was the right decision. I weighed my options and decided to make a left turn off the road I had inhabited the last four hours. I followed some other cars down my first series of turns, and then was all alone. I was traveling down an ice covered desolate road, littered with abandoned cars, some in ditches, some that had been wrecked. Mailboxes were down; it was erie. I tried to maintain a reasonable amount of speed (20 mph?) to keep my momentum going. I had to drive right through stop signs, but it worked. I didn’t get stuck and I made it up all the hills. I finally made it to the last “big” road that takes me home, and I felt like I was driving an obstacle course – jack knifed tractor trailers, cars stopped in the middle of the street. I was weaving in and out, on sheets of ice, praying that I wouldn’t have to stop, that I didn’t lose control and that I didn’t hit anything. God was answering prayers, because the last two miles of my journey, I made it through three (green) stoplights and didn’t have to stop once. Needless to say, I made it. I arrived home at 8:30pm after having left my work at 12:40pm, just 17 miles away. But I was fortunate; I was merely inconvenienced. I kept thinking about how much worse it could have been… what if I’d had the boys with me?? An infant? What if I’d had been pregnant and really had to pee? What if I was running low on fuel? What if I had taken my phone charger out of my car? What if I was still riding on bald tires? What if, what if… all these other scenarios were much more bleak than mine. I felt overwhelmed with gratefulness that my situation was not that bad. The next morning I awoke to the news and realized just how awful the whole thing was. I learned that there had been kids, on buses, on the interstate all night and that the National Guard was being dispatched to rescue them. I learned that the road I was on, that I almost stayed on, was never cleared and all of those cars (hundreds and hundreds and hundreds) sat there all night. My heart just broke for all of those people… those children. I learned that people sought refuge at Home Depot’s and Lowes’ and Publix’s and mom and pop shops all over the city. These businesses opened up their doors to care for the people of their communities. Of this who ordeal, the thing that will stick out the most were the acts of selflessness and community that I witnessed, and then later read about through a Facebook group called SnowedOutAtlanta. A woman from Atlanta, after being stuck in the gridlock herself, arrived home and mobilized a FB group where people all over Atlanta could make offers of assistance and those in need could look for help. The group now has over 55,000 members. I’ve been reading the cries for help, the answers to these cries and the beautiful success stories that have been shared. I have been consumed in this outpouring of humanity and it reaffirms to me that there are really good people out there. It shows me that God works in wonderful ways and uses a bad situation to bring out the best in people. If the forecast calls for snow, be really prepared and leave work before the snow starts! This entry was posted in Me and tagged Act of kindness, Atlanta, Community, Snow, SnowedOutAtlanta, Snowpocalypse, Traffic by biscuitsncrazy. Bookmark the permalink.